Unfortunately, your registration has been declined by the auctioneer. You can contact the auctioneer on 416.252.1955 for more information. You are the current highest bidder! To be sure to win, log in for the live auction broadcast on Mar 07, 2019 10am EST or increase your max bid. For Hilco Industrial delivery information please telephone 416.252.1955. One of the largest fastener manufacturers in Canada. Very diverse plant featuring nut formers, nut tappers, multi-die cold headers, screw manufacturing, bolt manufacturing and machinery for the production of specialty fasteners and cold formed parts. Large selection of thread rollers, wire drawers, inspection and plant support equipment. Machines as new as 2002. An 18% buyer’s premium will be charged for all BidSpotter purchases. A 16% buyer's premium will be charged for all onsite bidders. 13% sales tax will be applied as required. View tax rules. All bidders residing outside of the United States or Canada are required to submit via wire transfer a qualifying deposit of 25% of their total expected purchases. Deposit instructions will be emailed upon registration. Deposit must be received and confirmed prior to start of auction, and can take up to 72 hours to clear. Please register at least 3 business days prior to sale to allow sufficient time to process deposit. Buyers who wish to bid onsite will need complete registration at the auction on the day of the sale or during preview. If claiming the Export Exemption, the following documents must be submitted, in order to obtain a refund for GST paid. Customs documents showing port of exit / entry. Buyers are responsible for removing all of their purchases. Hilco does not provide rigging or shipping services and is not responsible for any rigging or shipping issues. Removal deadline: Small items need to be removed by 12 March; large items by 29 March. Removal dates and times: 8 - 29 March 2019, 8:00 AM - 4:00 PM local time Monday through Friday. Anyone performing removal will need to provide proper insurance. Prequalified riggers offering services for this sale will be listed here as they become available. EVERY ITEM SOLD "AS IS". NO GUARANTEES OR WARRANTIES WHATSOEVER. PLEASE INSPECT THE ITEMS BEFORE BIDDING. ALL SALES ARE FINAL - NO EXCEPTIONS. ALL SALES ARE SUBJECT TO A BUYER'S PREMIUM, THE RATE OF WHICH WILL VARY SALE TO SALE. Upon registration, Hilco Industrial Acquisitions Canada ULC ("Auctioneers") grants to the registered party ("Bidder"), the right to use the Hilco Industrial Acquisitions Canada ULC Online Auctions system for the purpose of bidding at an auction sale to be conducted by Auctioneers. Such right is granted at the Auctioneers sole discretion and may be revoked at any time. Only one (1) bidder per username/account is allowed. The party whose information was provided at the time of registration is responsible for all purchases under that bidder username/account number. Auctioneer reserves the right to refuse issuing an account number. Online bidders are required to provide a valid MasterCard or Visa in order to be approved to bid. This card will not automatically be charged without your written authorization, unless you fail to respond to our requests for payment. Please see your invoice for instructions on processing your payment by credit card. We reserve the right to charge your credit card for your purchases in the event of non-payment. All Bidders are required to provide accurate and complete personal information and the Bidder hereby further agrees that whether he is acting as a principal, an agent, or an officer or director of a corporation, or otherwise in any capacity whatsoever, the Bidder is personally liable for the payment of the purchase price, buyers premium and taxes payable with respect to any and all lot or lots for which the Bidder is the successful bidder at the auction. BUYERS PREMIUM: A Buyer's Premium will be in effect for this sale. Please see Sale Specific Terms for amount of BP. ALL PURCHASES MUST BE PAID IN FULL UPON RECEIPT OF INVOICE. Invoices must be paid within 24 hours of auction closing. All payments must be made by Certified Cheque or Wire Transfer, Visa and Mastercard accepted up to $1000. Certified Cheques must be made payable to Hilco Industrial Acquisitions Canada ULC. The auctioneer reserves the right to put articles back up for auction if deposit is not received at or before the time of sale. Absolutely no items will be removed before the conclusion of the sale and payment is made in full. All purchases must be paid for in advance of the goods being released. No goods will be released without presentation of the invoice marked "Paid in Full." Taxes arising on a sale, including applicable state sales taxes, shall be paid to the Auctioneer at the time of sale. Purchasers claiming exemptions from taxes must provide proof satisfactory to the Auctioneer of their entitlement to claim such exemption. In the absence of proof satisfactory to the Auctioneer, taxes shall be paid by the Purchaser. All articles will be sold conforming to the bid process, provided that the Auctioneer reserves the right to sell articles by individual group lots and "EN BLOC", as he deems appropriate. The Auctioneer reserves the right to sell on behalf of third parties, its own account or on the account of others, and may reject any and all bids. Should any dispute arise between two or more bidders or as to any bid, the lot in question may, at the Auctioneer's discretion, be immediately put up again and resold. The Auctioneer shall regulate all matters relating to the conduct of the auction and his decision shall be final and binding on all bidders. Any disputes as to bidding shall be settled by the Auctioneer at its sole discretion and the Auctioneer may, at its discretion, put any lot in dispute up for sale again. The Auctioneer is to regulate the bidding and be the sole arbiter. No bidder may retract his bid. All sales are final, on an "As Is", "In Place", "With All Faults" basis with no conditions or warranties whether expressed, implied, statutory or otherwise, including without limitation, warranties or conditions as to title, description, fitness for purpose, quantity, quality, merchantability, state, condition, location or otherwise. Please inspect all items before bidding. Preview and inspection dates will be published online at www.hilcocanada.com/auctions. All advertising, lot catalogs, or any other source of information provided by Auctioneer is subject to additions, deletions and prior sale. No sale shall be invalidated and the Auctioneer shall have no liability for a mis-description of any article or lot whether contained in a catalog, advertisement or otherwise. Descriptions have been prepared for guide purposes only and shall not be relied upon by the Purchaser for accuracy or completeness. Purchasers shall be deemed to have relied entirely upon their own inspections and investigations. While Hilco endeavors to ensure that the Websites are normally available 24 hours a day, Hilco shall not be liable if for any reason the Websites are unavailable at any time or for any period. Access to the Websites may be suspended temporarily and without notice in the case of system failure, maintenance or repair or for reasons beyond Hilco's control. Hilco reserves the right to relist or adjust bidding periods on any auction due to system malfunction. (d) are of any particular age, year of manufacture, model, make or condition. Bidder agrees he has satisfied himself and is not relying on Auctioneers, nor are Auctioneers liable, for any matter in respect of the above. Bidder further agrees to repair, at his cost, any lot purchased at the auction to a safe operating condition and, without limitation, to a condition which meets any standard or requirement of any applicable authority, law or regulation including those concerning any use to which the lot may be put. No article shall be removed unless paid for in full and all articles purchased shall be removed within the time frame specified by the Auctioneer. The Purchaser shall be responsible for all costs of removal and shall be liable for any damage, including without limitation, any environmental damage, caused during or as a result of the removal. Purchasers shall comply with all environmental laws and regulations and all requirements established by the Auctioneer for the removal of articles, including requirements as to bonding of independent contractors. All independent contractors must provide the Auctioneer, Owner and Landlord certificates of liability and worker's compensation insurance in amounts acceptable to the above parties. The Auctioneer has sole discretion to refuse any independent contractor from working on the premises. Where available, documents of transfer, including motor vehicle ownership documents, which are in the possession of the Auctioneer, will be provided to the Purchaser within seven days following the auction or as soon thereafter as such documents are available. The Bidder grants to the Auctioneers a security interest in the Purchases, to secure payment of the purchase price. In the event of non-payment, the Auctioneers may proceed to file the Bidder Registration Agreement as to perfect the security interest granted by this Security Agreement. If the Auctioneer is unable to deliver an article sold to a Purchaser due to fire, theft or any other reason whatsoever, the Auctioneer shall reimburse the Purchaser for all monies paid to the Auctioneer in respect of the article and the Auctioneer shall have no further liability to the Purchaser arising from or relating to such loss, including without limitation, any damages for loss of profits, travel time, expenses, or lost time. The Auctioneer reserves the right to refuse any applicant the privilege of bidding or attending at the auction and may revoke such privilege at any time. Time shall be of the essence. If a Purchaser fails to make payment or remove goods within the time periods hereinabove provided, the Auctioneer may resell the articles purchased by auction, private contract or otherwise, as the Auctioneer in his discretion deems advisable, and the Purchaser shall be liable for the short fall and all costs and expenses, including but not limited to interest rate (a minimum of 1.5% per month or 18% per annum), legal fees, moving and storage (a minimum rate of $2.00/sq. ft. per month) and commissions, incurred in such resale. 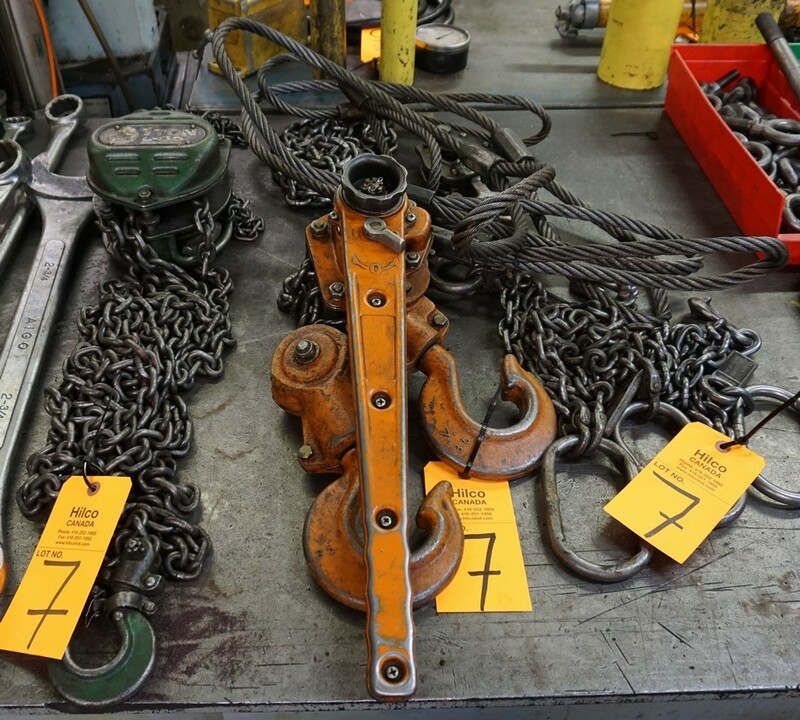 Bidder acknowledges that an auction site is a potentially dangerous place with noxious, corrosive and pressurized substances being present, heavy equipment being operated and electric circuits being live. Every person at the auction site before, during and after the auction sale shall be deemed to be there at their own risk with notice of the condition of the premises, the activities on the premises and the conduct of third parties and the Bidder shall so advise his agents and employees. No person shall have any claim against the Auctioneers, their agents, employees or principals for any injuries sustained nor for damages to or loss of property which may occur from any cause whatsoever. Bidder acknowledges he has received, read, and understands these Terms 1 through 21 above and agrees to comply with and be bound by such.